The Flamingos travelled to Greenland’s on Monday in good spirits. Our old sister club is blessed with some fine bowlers and so the morning progressed with each rink being keenly contested. By early afternoon, however, the game had taken on a different look and the Flamingos went on to record another fine away win. Friday saw the Gecko’s arriving at the club to a green that had experienced a wild hailstorm through the night and Graham, the owner of Country Bowls, working the carpet brush to clear the sitting water and make the green playable. After a couple of hours of hard work the game was back on. 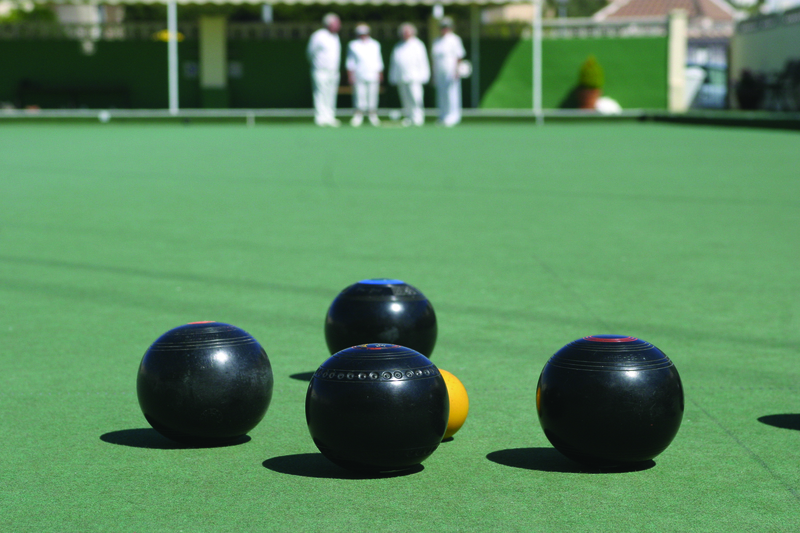 San Miguel were tough opposition coming to Country Bowls from a great win against the top of the league team Mazarron Miners. The Gecko’s played hard and fought to the end in very difficult high winds resulting in a great win. The Gecko’s winning teams were Pat Patton, Den Wade and Brian Patton. 26 – 10, Ben Noke, Pat Ray and Brian Ray. 22 – 18, And Brenda Jiggins, Derek Jiggins and Ray Emmet. 18 – 13. With a total of 95 shots against San Miguel on 88,the Gecko’s enjoyed a welcome 8 – 4 win. Our second game on Friday were the Cubs away to Vista Bella Conquistadors on a very windy afternoon. Whilst the bowls ran straight on one hand and swung far on the other, it took both teams all their skills and talent just to play to the jack. A closer game could not have been predicted with Country Bowls taking the shot difference of 6 and winning on 3 rinks. Overall score 8 – 4 to the Cubs. Winning rinks Joel Fernandez, Craig Dyson and Andy Bryce, Chris Stevens, Dot Davies and Peter Robins, and lastly Rob Hallam, Dave Smith and Niel West. Monday the Titans played at Quesada Diamonds and won 9-3, aggregate 90-74. Winners were D Rhodes K Jolliffe D Gerrard 21-10, G Shoots M Veale M Odell 18-13, S Johnson P Coffey I Brewster 19-15 and J Pooley R White B Kavanagh 19-19. The Cedars were at home to Emerald Isle Roundheads. final score , Shots 102 – 63. Points 10 – 2. Best winning rink – Zoe Wilcock, Carl Eagle, skip Ann Eagle. – 24 shots to 8. In the A Division, The Oaks were away to La Marina. Pipped to the post on a few rinks but unable to overcome a very good team on the day so no points to take away this time, Still onwards and upwards. Off we go again another exciting week. Not so good to start with though as the Explorers lost 9 – 3 at home to the Vistabella Albatrosses. Mike Stone and Co carrying on their winning ways 20 – 16. So well done Mike, Carol Smith and Steve Douglas. Peter Parsons, Don Fowkes and Barbara Forshaw had admirable draw at 20 – 20. Then away went the Pathfinders to play Vistabella Eagles and came away 12 – 0 winners much to the delight of Captain Jean Perchard and Hubby Terry who won 18 – 11 with help from Margaret Sadler. Not to be out done Barry Sadler, Dave McGaw and Desna Lowe won 26 – 14. Dave Hadaway, Bernie Carr and Jean Tregoing won 18 – 12 while John Withers, Mike Lowe and Reg Jackson managed one less 17 – 12. Garth Slater, Paul Tregoing and Trevor Hancock had a nice 22 – 14 win. This puts the Pathfinders at the top of the Discovery League. Tuesday was Race Night; It started out as Rat Racing and has since progressed to its present form of Monkey Racing. I daren’t comment how it got that name. Over eighty people attended and it was an extremely funny and jovial evening with all punters having a great time. Sue Freeman was the overall Champion Jockey closely followed by Trevor Hancock. Thanks to all members who put in the time and effort to make it such a success. Not much success in the Winter league when we travelled up to Javea being beaten 10 – 2. Our winning rink was Don Fowkes, Peter Parsons, Jean Fowkes and Jan Parsons, well done to them. Come Friday and in the Southern League Div A the Ospreys cut the Greenland Oaks down to size with a 12 – 0 whopping. Rumour has it that the Captain might not get another game this year the way things are going. Roy Hart, Don Fowkes and Barbara Forshaw won 31 – 9. Peter Parsons, Wendy Latham and Anne Stone 18 – 15 winners. Mike Stone (the man in form), Cliff Rawlinson and Janet Parsons had a fine 15 – 10 win. Alex Whyte, Jim Reeves and Kathy Manning came back to win 23 – 18. Shirley Hadaway, Phil Pape and Margaret McLaughlin had a good win 21 – 10. In the Voyager Division both the Sputniks and the Pioneers visited El Rancho and both had good results.The Sputniks winning by 82 shots to 64 picking up 10 points against the Palaminos whilst the Pioneers won by 87 shots to 78 against the Raiders.For the Sputniks best winning rinks came from Hilary Clarke, Rod Edgerton and Alan Ralph and from Joe Kocsis, Molly Russell and Willie McEvoy both winning their matches by 5 shots whilst Dot Kocsis,Jim Eastwood and Lee Plummer won by 4 shots. For the Pioneers Pat Moore with Bill & Sue Jordan won by 19 shots and Joe Elkin,Derek Smith and Rab Logan won by 13 shots. In the Enterprise Division the Apollos entertained Quesada Pearls and won by 105 shots to 60 picking up 10 points.Star performance came from the rink of Derek Biggs,Jenny Bowman and Irene Mangan winning 23 shots to 8. Our Winter League team travelled to Bonalba and won on 2 of the 5 rinks picking up 4 points. A further rink was close which would have enabled a draw with their opponents. In the Southern League A Division the Blues visited San Luis Lions and picked up 2 points the overall match shots being 64-111 winning on the rink of Joy & Brian Gardiner with Jean Cooper by 18 shots to 14. In the B Division the Golds played their re-arranged home game against El Rancho Broncos and won by 116 shots to 69 picking up 10 points with biggest winning rink coming from Jo Elkin,Tony Dalton and Vic Mahomet winning 37-13 closely followed by Derek Smith, Val Dalton and Rab Logan winning by 16 shots and Doug Beattie,Norman Adcroft and Fay Beattie winning by 15 shots the Golds then on Friday travelled to San Luis Leopards and had an excellent 118-62 shots victory.the team picked up 11 points to the Leopards 1. Well played to all of the team keeping up their winning run. In the C Division the Silvers played the Rangers at a very windy El Rancho and lost by 96 shots to 51.Well done to Joe Kocsis, Ken Stringfellow and John Clarke who managed to win on their rink by 20 shots to 13 picking up 2 points for the Silvers. A very good result away at Quesada winning on two rinks and drawing on two. Well done everyone. After the Toreadors good start to the season in division B it came to a halt against the Royals. The Toreadors won on one rink and drew on one rink. Well done to the winning rink of Jan and Bill Webster skip John Hunt. A very hard fought game at home to Vistabells Drivers. The Matadors won on three rinks but lost the overall shots. Well done to the three winning rinks of Lynn Armitage, Ronnie Cairns skip Dave Melville, Pauline Merry, June Young skip Chris Merry, Mike Farrelly, Danny King skip Margaret Finlayson. Another disappointing match for the Toreadors, maybe the long journey to Mazarron took its toll on the Toreadors. Winning on two rinks well done to Jan Soars, Phil Goble skip Rod Chamberlain, Sue Bounds, Iain Sheridan skip Graham Smythe. At home to Vistabella Monte Mar won on two rinks and had close games on the others. Well done to the winning rinks of Pauline Merry, Sheila Roberts, Ronnie Cairns skip Chris Merry and Jan Soars, June Young, Phil Goble skip Dave Melville. Todays game was played in very windy conditions. Winning on three rinks and losing on two but won the overall shots. Well done to the winning rinks of Gina Hindle, Ronnie Cairns skip Dave Melville, Tanya Oliver, Bill Judd skip Jack Burrell, Paula Cleeter, Pauline Woodfine skip Barrie Woodfine. On Monday, a very overcast day, Quesada Diamonds entertained the table topping Emerald Isle Titans. There were some very close games and whilst there were some showers, rain didn’t stop play! Emerald Isle Titans won on 3 rinks and drew on one rink after picking up 3 shots on the last end and Quesada Diamonds won on one rink and drew on one rink. Shots were 74 to Quesada Diamonds and 90 to Emerald Isle Titans. Score was 3 points to Quesada Diamonds and 9 points to Emerald Isle Titans. The friendly which was a very good game ended in Quesada’s favour 23 shots to 13 shots. Meantime, Quesada Pearls were playing at La Siesta in similar cold and showery conditions. La Siesta Apollo’s had an excellent mornings bowls, leading all the way in a match that unfortunately ended with Quesada winning on only one rink. The final score was 10 points to La Siesta and 2 points to Quesada with the shots 105-60. In the Discovery Division, Quesada Rubies played at Emerald Isle against the Moonrakers who won the match 10-2 points and 113-58 shots. On Wednesday the Winter league team had an early start this week and travelled to Benitachell for their match. The match ended with 6 points to each team but Benitachell finished ahead on shots 91-74. And on Friday, a glorious sunny, but rather windy day, Quesada Swifts hosted El Rancho. In a match that was played in excellent spirits with some good bowling from both teams, the Swifts ended the match with a good win of 9-3 points. For more information about our club, please contact our membership secretary Angie Goddard newleaf2014@hotmail.com New bowlers are always welcome and introductory coaching is available. SAN LUIS BOWLS CLUB REPORT 09.11.18. The week started with a cold drizzly, miserable Monday and finished on Friday with a cold, bright but very windy morning. Not really the results we wanted for some of our teams this week but hopefully we will do better next week. South Alicante League: Monday 5th SL Klingons home v SM Alsations; a great result 10pts-2, shots 109-72. Winners: Colin Jackson, June & Keith Jones 25-9, Steve Simmons, Pam Lockett, Ian Kenyon 20-12, William Holtham, Sabrina & Russell Marks 32-11, Ann Holland, Keith Phillips, Ray Pollock 22-20. SL Trekkers home v SM Beagles also a great result, 10pts-2, shots 92-90. Winners: Shirley Verity, Jo & Jules Pering 19-15, Helen Hammond, Bill Webb, Scott Malden 17-15, Pat Bird, Allen Bowen, Les Bedford 21-18, Kevin McKenna, Marina Beardsall, Barry Edwards 18-15. SL Vulcans: BYE. SL Romulans away v SM Pointers had a much better result this week, 4pts-8, 64 shots-101. Winners: Pat Baylis, Lyndon Johnson, Joe Millis 16-14, Chris Phillips, Terry Baylis, Geoff Francis 20-17. Wednesday 7th Winter League: BYE. Southern League: Friday 9th SL Lions away v LS Blues, eventually finished with a great result 10 pts-2, shots 101-64. Winners: Ann Holland, Sheila Cammack, Ray Pollock 23-12, Margaret Morrison, Steve Simmons, Neil Morrison 27-12, Kath Reid, Pam Lockett, Ian Kenyon 16-11, Bob White, Keith Phillips, Ray Clarke 21-11. SL Tigers, away at Vistabella, had a hard time, being knocked over by the wind and the Lanzadores; 0 pts-12, shots 55-105. SL Leopards home v LS Golds, had a tough match; 1 pt-11, 62 shots-118. Well done: Steve Rossiter, Kath Waywell, Brenda Brown 16-16. SL Pumas home, against a very strong VB Swingers team, had some close games but unfortunately the result didn’t go as hoped 0 pts-12, shots 70-107. The Dalmatians were home to Greenland’s Maples this week and managed an 8 points to 4 victory, 99 shots to 82. The highest winning rink belonged to Bob Nesbitt, Dave Champion & Barbara Scotthern (remember mentioning them last week too!) 25:8. The Pointers took over in the afternoon beating the San Luis Romulans 8:4 with 101 shots to 64. The 2 losing rinks lost by the smallest of margins but the glory went to Bob Hanton, Ann Allen & Dave Greenland winning 27:8. The Beagles were away at San Luis facing the Trekkers but were able to win on just 1 rink with overall shots 90:92 – how close was that! Well done to Dave Johnson, Val Hignett & Mary Dyer winning 27:17. As the rain increased, the Alsatians turned up to face the Klingons and faired no better, 72 shots to 109. Well done to Anita Brown, Ron Nairey & Eddie Cowan (another deja-vu moment) for getting the 2 points, 20:10. The Winter League team was at home to Greenlands this week, taking the match 8 points to 4, 87:82. The highest winners were Don Whitney, Val Collier, Chris Collier & Stuart Denholm 23:6, helping to get the team to 2nd place. On Friday, the Boxers travelled to Country Bowls to take on the Geckos and came away with 4 points, 88 shots to 95. The highest winners, here we go again! Bob Nesbitt and Barbara Scotthern, this time teamed up with Ann Young. However, the win of the week went to the Bulldogs who welcomed the Emerald Isle Claymores to SMBC and finished with 10 points, 90 shots to 65. The losing rink only lost by 2, but the gold star, as last week, belonged to Sandy Hannan, Tom Dalgleish & Dave Greenland, 25 points to 9. SAL Enterprise league Albatrosses away to La Marina Explorers. A good away result with three wins and a drawn game..some close calls. VB 97(9) – 86(3) LM. The Drivers were away to MonteMar Matadors, they had two big wins which gave them enough shots to win the long game making it a draw.. VB 103(6) – 83(6) MM. The Discovery league Eagles had a home game against La Marina Pathfinders, the opposition were strong and carried all the points back up the N332. VB 63(0) – 101(12) Come on you Eagles we know you can do it! The Voyager league Buggies also at home playing the Emerald Isle Saturn’s had four wins, the Saturn’s were penalised for not bringing a mixed team. VB 86(9) – 62(3) EI. WINTER LEAGUE. Vistabella away to MonteMar, it was well worth the journey..three wins for another eight points. VB 90(8) – 75(4) MM. Great company and a lovely carvery before we hit the road homewards. Southern League A Div Lanzadores welcomed San Luis Tigers and had full points across the board sending the tigers home with their furry tails between their legs. Shots VB 105 (12) – 55(0) SL. The Picadors away to Emerald Isle Cavaliers had the reverse and came home with nil pois! VB 60(0) -113 (12) EL. C Div Swingers were away playing the Pumas at San Luis where they had another fantastic win taking all the points, VB 107(12) – 70(0) SL. The Conquistadors at home to the Country Bowls Cubs won on two rinks, the windy conditions made it tricky for both teams VB 81(4) – 87(8)CB.